Your new home...get to know it! What is a stage? 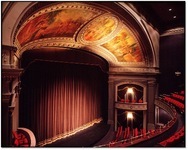 What is the difference between an auditorium and a theatre? Do all theatres look alike? Hopefully, by the end of this unit, you will be well familiar with the types of theatres and the language theatre practitioners use to communicate with one another. In a very famous, important book on theatre, Peter Brook called the stage The Empty Space. I know you probably haven't read the book, but what do you think he might have meant by calling it that? If you've only seen school plays, then you are probably most familiar with one type of stage. However, there are many types of stages, each one with advantages and disadvantages we will discuss. Also, by exploring the links below, you will learn the language of stage direction. The benefits of learning this language is not very obvious at first, but ask some of your friends who have been in a play and I bet they will testify to the importance of learning stage areas and body positions.